Composite Doors Kildare covers all regions and towns within the county. The current focus of Composite Doors Systems is to offer a very high quality and durable door at affordable prices. In the current climate homeowners feel the need to upgrade their security and especially the entry points to their homes and apartments and that is one of the many reasons why they choose Composite Door systems. Burglars now don’t waste time trying to gain entry through up-stair windows as they did in years gone by. The majority of burglaries now occur through the front door or side doors. Doors are manufactured to the design and detail selected by the customer. Really you can personalize your own hall door. 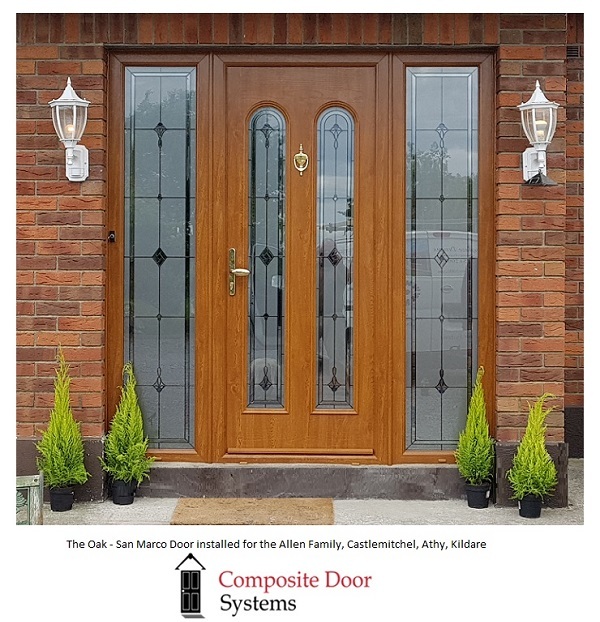 Composite Doors Kildare – Quote Best Prices. Prices vary from door to door, but currently the base price for a single door is around €1500.00. This is a price for genuine Palladio Front Doors and Frame. Insulation Insulated doors are now required to upgrade any home to current standards which will receive a rating. Composite Doors Kildare are ideally placed to satisfy this requirement. The doors are manufactured to the highest standards and achieve a combined u-value of 0,64. All weather seals are BS standard 9001/2000 and 7412. The triple glazed units inserted in the doors use a warm edge spacer bar to enhance insulation. Security with Composite Doors are second to none in the market. The current hardware used in the doors are PAS23/24 approved and with the hook and shoot-bolt locks you will feel very secure. Thieves and burglars tend to look for easier options to ply their trade. It is a well known fact that intruders use the front door to enter homes. Composite Doors Kildare – Covers All Areas. In terms of design, style and colour we can custom design a door from the Palladio Collection to satisfy all your needs. The product range from both companies are extensive and will present many options to create and design a unique door for your home.